Changing lanes on any road should be done safely and courteously. 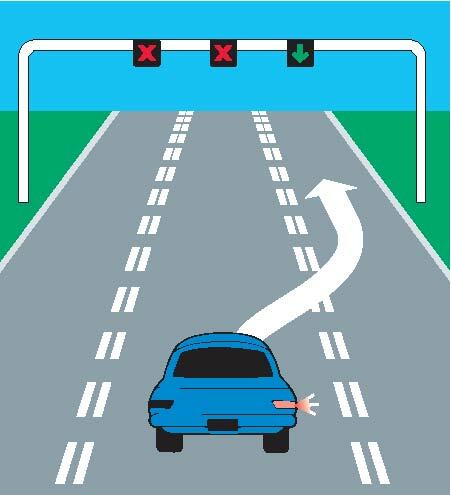 Have you ever seen how sometimes a driver in Lane 3 going straight suddenly decides to switch to Lane No. 1 so he that he can turn left or rake a U-turn? Or a driver who is signalling his intention to turn right for a long time but at the last minute turns left even as the right indicator is still on? These are the kind of people who add to the accident statistics of Bahrain, and you should make sure you do not become one of them. Indeed the key to good driving is to plan your trip keeping in mind the time it generally takes to reach your destination and mentally making note of the itinerary – which lanes you ought to follow, where are the bottlenecks you may have noticed on your previous trips, where the road projects may have resulted in diversions etc. If everyone had a clear picture in his mind, before setting out from his home or office, of the route he should be taking, the lanes he should be following and the time he should expect to cover that stretch, then half the battle is won. Simply put, more the number of organised drivers on the road, less the number of accidents. Yes, organization is the key to safe driving. If you have the time scale in your mind then you will not be in a tearing hurry because you are late. As an organized driver you would know when to set out on your trip and what to expect on the road and how much time would be consumed covering particular patches on that stretch, give or take five to ten minutes. Since you would not be late you would have no tension. Which means you could keep to your steady speed of between 80 km/hr and 100km/hr. No need to accelerate to 120km/hr or 140km/hr on the highways within the city. No anxiety or inclination to jump that red light to make up for lost time since you have already planned your trip and you have not lost any time. And if you have the route map in your mind then you will not be switching lanes in confusion or to overtake those in other lanes so you could get ahead and make up for delays because you are not late in the first place. The school, the office, the shopping mall, the houses of friends and relatives, the hospital, the bank, the park—these are generally the places one frequents. And in the course of our various trips we all become familiar with the route and whether the road on a particular stretch is being dug up, or being widened causing delays. So once we have the time frame and the route in our memory, we need not speed to ‘make up’ for lost time nor to switch lanes from No. 3 to No. 1 and vice versa. We stay in our lane and we drive at our steady pace.